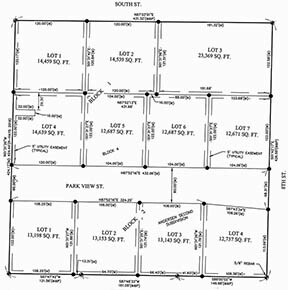 Preliminary plat map of South Park Subdivision. A preliminary plat for the new South Park Subdivision was recommended for approval by the Albion Planning Comnmission during its regular meeting Monday night, March 6. Applicants Dana and Karen Andersen submitted a plan for the subdivision containing 11 residential lots. It will be bordered by South Street on the north, Eighth Street on the east, and the Boone County Fairgrounds on the west. This property was annexed into the city limits effective Jan. 1, 2017. Lot sizes in the subdivision would range in size from 104 x 122 feet up to 122 x 191 feet. As proposed, the subdivision would include a 60-foot residential street, called Park View Street, between Eighth Street and the west border of the fairgrounds. Planning board members discussed installation of water, sewer and street extensions to the planned subdivision with Andrew Devine, city administrator and zoning official. Devine said a subdivision development plan would likely be brought to the city council for consideration. Under this agreement, the city could finance up to 80 percent of the development cost and create a special assessment district to assess these costs back to the lots when they are sold. The developer would finance at least 20 percent of the infrastructure cost. Albion City Council will consider action on the preliminary plat at its regular meeting next Tuesday, March 14, at 7:30 p.m.